It feels like it's been too long since we saw the British royals in Special Occasion Mode. Hats and the lot, you know. I suppose it hasn't actually been that long and you have to take the Queen out of the equation, because hats and the lot is her Permanent Mode, but still. What I'm trying to say here is that I'm delighted to see that Sophie hatted up nice and proper last week. 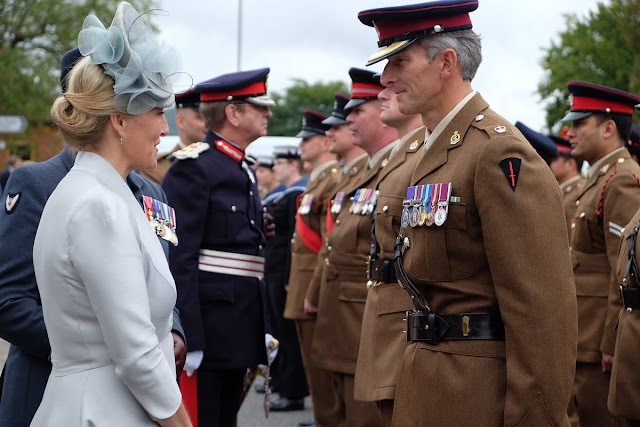 The Countess of Wessex attended the Headley Court Farewell Parade on Friday. You know this is Special Occasion Mode because it's a repeat from a Very Special Occasion: QEII's 90th birthday service in 2016. This is such a Sophie classic. It's two of her favorite designers, a bespoke Suzannah coat dress in a sleek silhouette with a Jane Taylor hat and a sweeping updo. She loves a midi length, and this one is careful not to overwhelm. Chic, I say. Only fitting they named the design after her.